My name is Jessica Prestage, I’m 18 years old and I am from England. 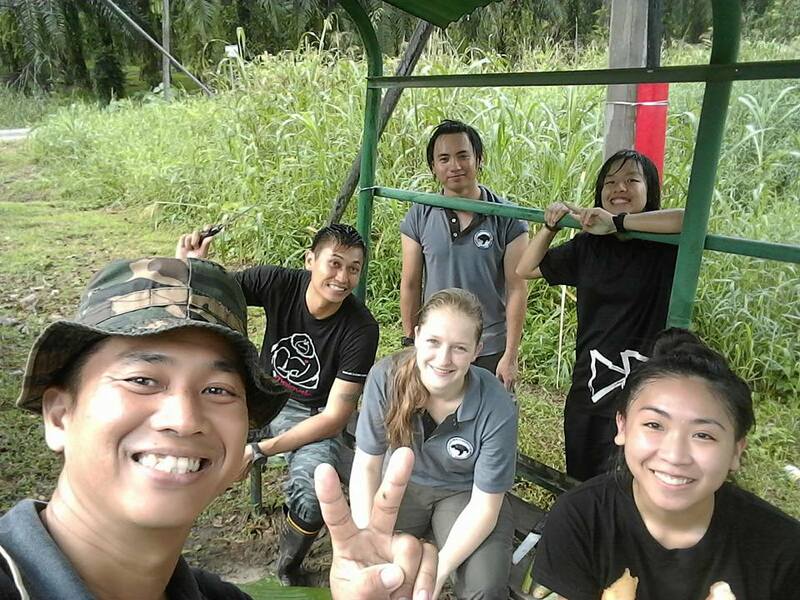 I have just completed a two week volunteering programme with Sun Bear’s in Borneo. I finished school in May and I will be starting university in September. During this break, I wanted to make the most of my long summer holiday by volunteering somewhere new that would allow me to learn about a different country and the conservation systems there. I looked at the opportunities available with a travel gap year company called ‘Oyster’. 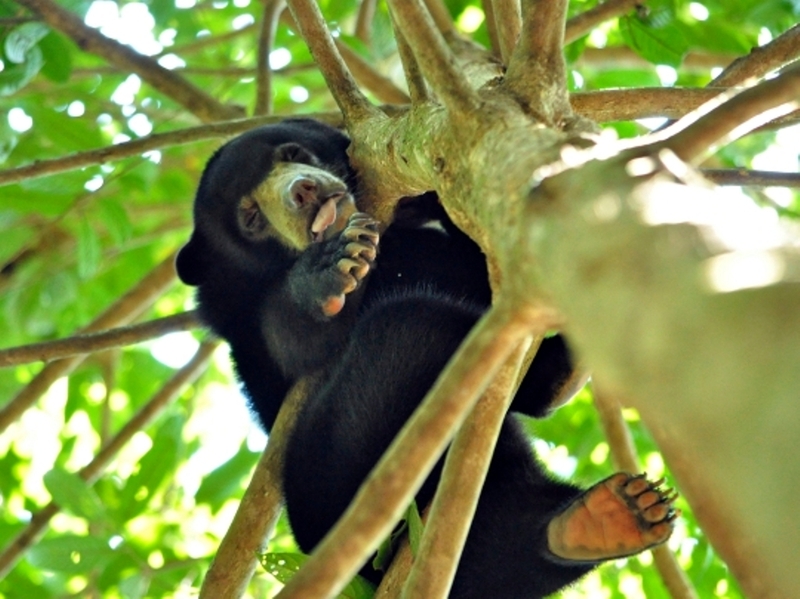 They have a lot of varied projects, but working with sun bears stood out as the most interesting. At first, I was unsure whether I would be able to travel to Borneo for this project, as it requires a long journey – in total, over 15 hours on a plane. But I decided that I could not pass up the chance to come out here and spend two weeks working with the team to care for, monitor and learn about sun bears. An opportunity like this may not come round again, so I selected this project and started booking it. On my first day working at the centre, I was shown around with the other volunteer, Jackie. Soon after our tour, we started working; the days followed a schedule, which rotated in order to allow everyone to help with different aspects of the bear house. 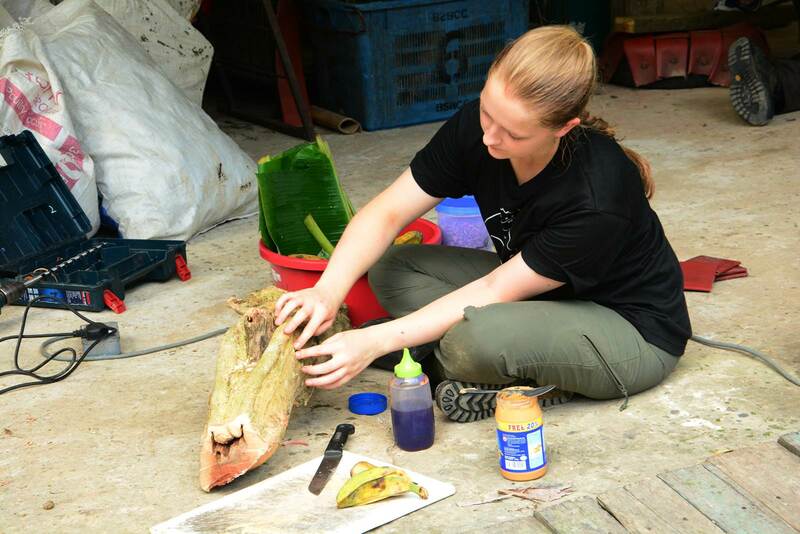 In the morning, the tasks included husbandry (cleaning the cages), which was separated into bear house one and bear house two, preparing food in the kitchen and fence checks. This also meant that every day we worked with different team members, allowing us to get to know each other and work together. The afternoons consisted of creating enrichment; enrichment is what is used to engage the bears’ natural instincts of climbing, foraging and exploring. There were a wide range of materials that we had available to create enrichment, such as old fire hoses, donated by local fire stations, tyres, logs and branches, and bamboo. I enjoyed creating the enrichment, but personally I found the dry cages the most rewarding form of enrichment. Creating a dry cage involves laying a bed of dry leaves, collected the previous day, and adding logs and branches to mimic a forest environment. We also added log feeders, which is simply a log with holes drilled into it, each filled with treats. The normal treats used in enrichment to entice the bears to investigate and engage with it are honey, peanut butter, bananas, dog treats and banana leaves. These have strong smells, added to which the bears enjoy them – consequently the enrichment is regularly destroyed in order to access every crumb of food! The dry cage is my favourite enrichment because as soon as the bears are let back into the cage, they start exploring, digging and ripping open the logs. Dog treats and mealworms are scattered in the leaves to encourage foraging, which is often the first thing they do. It is rewarding when the bears do this as it shows that they still have their instincts and have a high chance of being released back into the wild. Working as part of the team here was a fantastic experience – as a volunteer, initially I was worried that I would slow the work down and be in the way, but I was quickly just another member of the team. Everyone was very welcoming, and I felt accepted as a team member and a friend. Although I was the only English person on site, everyone was eager to talk to me, asking questions about England and finding out about me. In the first few days, I struggled to adapt to the heat; this meant that I had to have regular breaks and drink a lot of water. Everyone kept an eye on me and checked on me, asking if I was okay, which made me feel comfortable and looked after. I knew that if I did have a problem, I could talk to them. However, I did not have any problems throughout the project – the team are friendly, funny and always up for a laugh. This made my time here more enjoyable, as I was getting to know people and making friends, whilst working with the bears. During my two weeks at the conservation centre, I got to know most of the bears. Initially, I memorised the names based on which cages they were in, but as the two weeks progressed I learnt more about each bear. Their chest marks are like our fingerprints; each one is unique and can be used to identify the bear. The size, shape and colour can vary. However, some of the older bears do not climb so much, so they are recognised by their faces and behaviour more than the chest marks. I found it interesting as I got to know more of the bears, as they are all so different. Knowing their personalities made it possible to create enrichment for specific bears to try to engage them for as long as possible. Naturally, I had a favourite; but doesn’t everyone? I became fond of Along, as he was always sitting on the hanging log or hammock in his cage, watching what was going on. He’s a handsome bear, and as with most of the bears in the centre, I hope that he will be released into the wild in the near future. Some of the older bears cannot be rehabilitated, but I can’t imagine a better place for them to live than here at the centre. The staff are incredible and the facilities are brilliant; the bears have all they could ask for and more. I am so lucky to have been able to spend time here with such passionate people, who care so much for the future of these bears and other wildlife that is at risk due to human presence and actions in the natural environments. I have learnt a lot during the project and I hope to return someday to see the progress here. I cannot thank everyone enough for giving me this opportunity. It’s been an unforgettable experience, with amazing people. I look forward to visiting in the future! 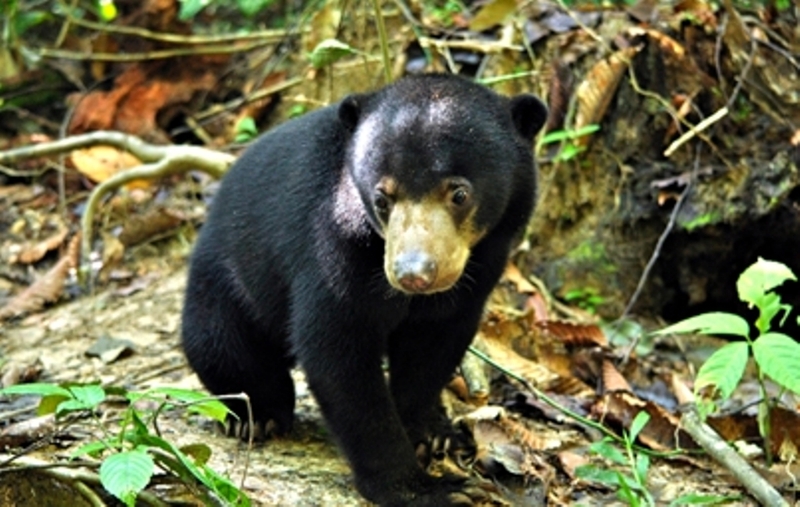 If you are interested in volunteering with sun bears have a look at our fantastic programme in Borneo.